Kinesiology is system for relieving stressors which causes a range of feelings from discomfort to severe, progressing to chronic pain and emotional distresses through life from simple frustrations to major emotional events. If these stressors are not addressed the constant stress compounds and is stored in the muscles and organs of the body causing continued emotional, physical and mental distress leading to acute and/or chronic disease (unhealthy ease). With the overwhelming increase in preventable diseases seen in the hospital systems, Charllotte-Ann, a Registered Nurse and Kinesiology Practitioner, has chosen to manage better health by prevention through natural therapies; in particular Kinesiology which is a system for managing physical and emotional stresses which cause ill health. 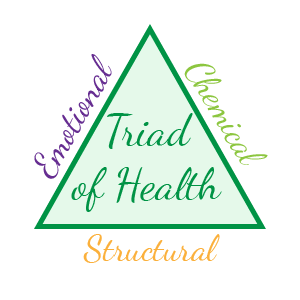 Kinesiology uses the Triad of Health, Chemical, Emotional and Structural factors to indicate the best possible balance of the major health categories.